Are you looking to achieve clear, healthy-looking skin but don't want the hassle of going to the spa? Indian Healing Clay from Aztec Secret is an in-home facial treatment that could give you the same results as the expensive services offered at a spa. Made from 100% all-natural calcium bentonite (green) clay, Aztec Secret's Indian Healing Clay is thought to help clear up a wide range of skin imperfections. Some of those imperfections include acne spots, trouble skin and dry, under-hydrated skin. It can also be used for foot soaks and treating insect bites as well. There are no additives or fragrances in Indian Healing Clay from Aztec Secret, so even those with ultra-sensitive skin can try it. Order today for yourself and see the changes in your skin with as little as one application. Warnings: For external use only. Discontinue use if irritation occurs. 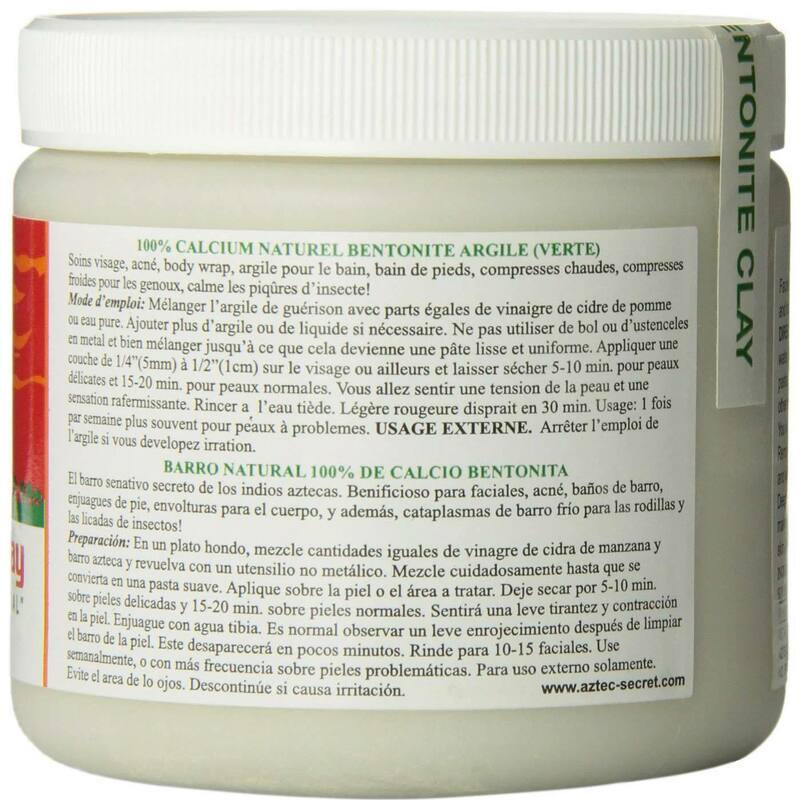 Notes: 100% Natural Calcium Bentonite (green) Clay, Sun-dried. No additives, no fragrances, no animal testing, no animal products. 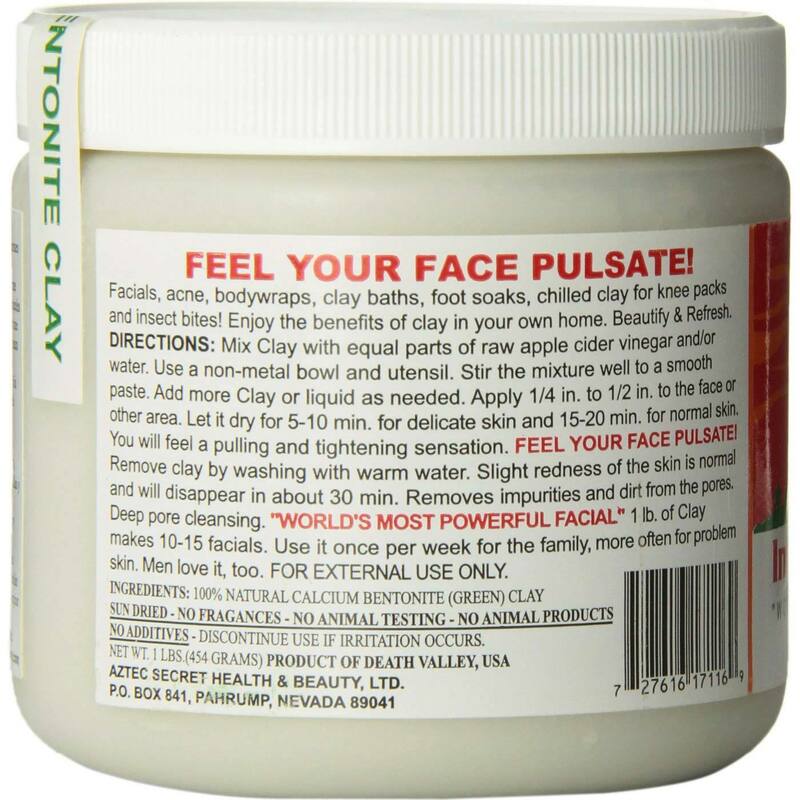 INGREDIENTS: 100% Natural Calcium Bentonite (Green) Clay. DIRECTIONS: Mix healing clay with equal parts of raw apple cider vinegar and/or water. Best to use a non-metal bowl and utensil. Stir the mixture well until it is a smooth paste. Add more clay or liquid as needed. Apply 1/4 to 1/2 inch layer to the face or other area. Let it dry for 5-10 minutes for delicate skin and 15-20 minutes for normal skin. You will feel a pulling and tightening sensation. Remove clay by washing with warm water. Slight redness of the skin is normal and will disappear in about 30 minutes. 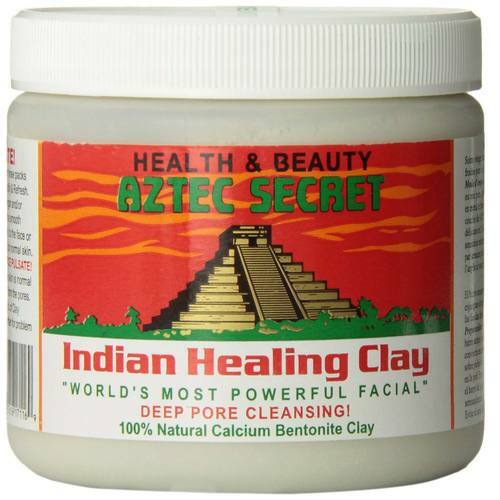 The customer reviews posted below are based on individual consumer experiences and may NOT necessarily represent what expected results will be from using or taking Aztec Secret Indian Healing Clay - 1 lb. These results may not be typical and you should not necessarily expect to receive the same results. Actual results may vary. If you haven't tried this you DEFINITELY SHOULD! This stuff really works wonders! Using this in the form of a facial mask has really aided in prevent my acne prone skin from breaking out. Using Indian Healing Clay regularly has also helped balance out the oils in my combination oily skin. I also believe incorporating this clay mask into my skincare regimen has also helped even out my skin tone and clear up pre-existing acne scars. I am very happy with my request, it really worked, I liked the final result, thankful for the shipping! It's so amazing, cleared up skin. OMG! This Indian Clay is the best thing that was ever invented. I suffered bad acne as a young adult. Someone told me to mix this brand of Indian Clay alone with Apple Cider Vinegar to heal the acne scare and cleanse my face. Now My skin is clearer and smoother than ever. My mom and teenage daughter uses it as well. AMAZING PRODUCT! You can use it for your hair and also to clean out your pores and that's amazing about it! If you have curly hair and want to leave it healthy and have amazing curls, you can use a hair mask with the Indian healing clay. Is so amazing, you can add Apple Cider Vinegar with your Healing Clay and apply it to your hair, works great! I hope you like it as much as I do!